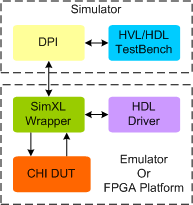 Compliant with the latest ARM AMBA5 CHI specification (CHI-B). Supports CHI Master, Slave, Interconnect. Support for Protocol, Network and Link layer communication, including flow control mechanisms across RN2HN and HN2SN links. Supports Link initialization as per specs. Support for skipping link initialization and retrying failed link initialization. Configurable credit including dynamic and pre-allocated credit control. Support for all Transaction types and Opcodes. Supports Direct Memory Transfer and Direct Cache Transfer. Supports Exclusive accesses, Cache Stashing, DVM Operations. Supports Deallocating transactions, Poison and Data Check. Support for Request transactions with/without a Retry and cancelling of transactions. Ability to issue multiple outstanding Non-snoopable/Snoopable transactions. Programmable Protocol flit delays and different channels delays. Interconnect has the ability to replicate RN/SN inserted delays. Supports all write/read responses and snoop responses. Interconnect generated main memory access transactions. Snooped RN response to a snoop transaction. Supports fine grain control of response per address or per transaction. Device and Normal memory types support. Support for ordering of transactions/responses and reordering of data packets. Support for error injection during Link initialization. Rich set of configuration parameters to control CHI functionality. Supports on-the-fly protocol and data checking including port level and system level checks. Callbacks in Master, Slave and Interconnect for various events. AMBA5 CHI Synthesizable IP comes with complete testsuite to test every feature of ARM AMBA5 CHI specification.